Anemia, a ‘silent killer’ among women in India: India has among the highest number of cases of anemia in the world. Indian Council of Medical Research and District Level Household Surveys have shown that prevalence of anemia is very high (ranging between 80->90%) in preschool children, pregnant and lactating women and adolescent girls. Low birth weight infants, young children and women of childbearing age are particularly at risk of anemia. Anemia begins in childhood, worsens during adolescence in girls and gets aggravated during pregnancy. Adolescent girls, who constitute a sizable segment of its population form a vulnerable group and are at a greater risk of morbidity and mortality. It is the shaping period of life when maximum amount of physical, psychological and behavioural changes take place. This is a vulnerable period in the human life cycle for the development of nutritional anemia. 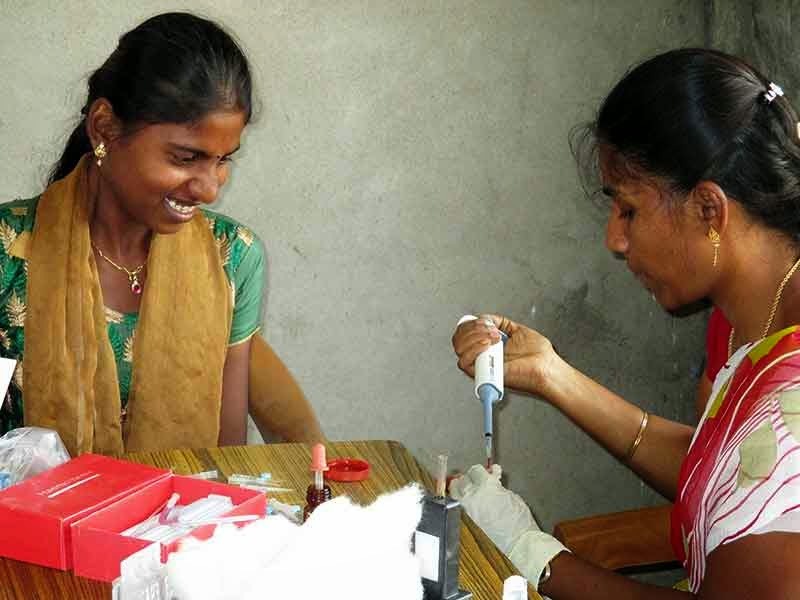 We organised haemoglobin checks for adolescent girls in local villages and arranged for trained lab technicians to come and administer the tests. None of the girls had normal haemoglobin levels. All of the girls received advice and were referred to the government hospital and local village health centres for treatment and nutritional support.